FILE - Votes are counted at a polling station in Djibouti City, April 8, 2016. Djibouti's main opposition party boycotted those elections and says it will not participate in legislative elections Friday. After boycotting presidential elections in 2016, Djibouti’s main opposition party, the Movement for Democratic Renewal and Development (MRD), says it will not participate in legislative elections Friday, deepening concerns that democracy in the East African nation isn’t working. “In Djibouti, there’s a problem of legitimacy, of democratic legitimacy, of parliamentary legitimacy because elections are never fair and free,” Daher Ahmed Farah, the leader of MRD, told VOA. Farah said the government went back on a deal forged in late 2014 to establish an independent national electoral commission. Without an autonomous body to oversee voting, he said, it’s impossible to ensure the integrity of the process. Despite interest in reform, Djiboutians’ push for democracy has come up short, Farah said, because the government suppresses dissent and stifles the press. FILE - Djibouti's president, Ismail Omar Guelleh, arrives for a Reuters interview at his home in Ethiopia's capital, Addis Ababa, Jan. 30, 2016. Djibouti is a representative democratic republic whose president serves six-year terms. The current president, Ismaïl Omar Guelleh, has held office for nearly two decades, making him one of Africa’s longest serving leaders. In the most recent presidential election, in 2016, he won more than 86 percent of the vote. He succeeded his uncle, who led for 22 years following independence from French colonial rule. The National Assembly, Djibouti’s legislative body, has 65 seats and also holds significant power. With the opposition boycotting the election the candidates for the legislature will represent the ruling party. 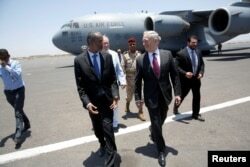 FILE - U.S. Defense Secretary James Mattis is greeted by Djibouti's minister of defense, Ali Hasan Bahdon, as he arrives at Djibouti-Ambouli International Airport in Ambouli, Djibouti, April 23, 2017. Djibouti has little in the way of national resources, and it’s one of Africa’s smallest countries. But a strategic location in East Africa, where the Red Sea meets the Gulf of Aden, has made Djibouti an appealing spot for foreign military bases and a major player in regional politics. The United States, France, Japan, China and Italy each have bases in Djibouti, giving it an outsized footprint in a region with much larger economies and more advanced militaries. The French base also houses troops from Spain and Germany. But this international presence may have limits. Sim Tack is a former senior analyst at Stratfor, a group that tracks global military tactics and strategies. He said Djibouti faces significant security challenges, and that makes close alliances with foreign states appealing. For Farah, a foreign presence in Djibouti increases the country’s security, but that hasn’t translated into benefits for everyday Djiboutians. “[Djibouti’s] stability matters, acknowledged, but stability must take into account the needs of people. Stability for whom? Stability, the real stability, is for people, is for development, is for social justice, is for a free economy. It’s not for the regime. The current stability is only good for the regime,” Farah said. Mohamed Siad Doualeh, Djibouti’s permanent representative to the United Nations and its ambassador to the United States and Canada, did not respond to requests for an interview. However, top officials in Djibouti have met with members of an African Union observation mission and welcomed oversight from the international body.